Since I started playing the game, the town of “Other Springfield” has fascinated me. Sure, it’s just a template town constructed by the developers to give players an idea of how to build their own town, but I’ve always seen it as a challenge. My town has always strived to be at the very least, a 95% replica of this alternate Springfield. For several months, my town was a replica of both the Lv. 20 and Lv. 16 versions of Other Springfield. Once I unlocked the full full 13 × 13 grid I found out it was possible to fit both of these towns on one map. Of course you had to pick-and-choose where you wanted certain buildings, which created a bit of an artistic challenge. Once I filled in the basics, the excess land was used to house buildings Other Springfield hadn’t accounted for, like the Springfield Hospital or some of the content from the Treehouse of Horror XXIII update. It was only in doing this that I discovered that the devlopers don’t always play by the same rules players do. The following are a few examples where buildings and decorations are placed on the map in ways that are impossible for the player to replicate. Surprisingly enough, the quest line involving Superintendent Chalmers revolves around having him superintend. Now that matters at Springfield Elementary have been taken care of, it’s time to focus on higher education. A majority of the quest in this story arc take place at the newly built Springfield High School. Soon you will learn that Chalmers isn’t satisfied with the students at the high school, and will go to great lengths to whip these youth into shape. After this quest line is complete you will be finished with main story line of the Level 34 update. If the developers stay consistent with updates as they have been, we could see Level 35 in approximately two-weeks time. What will be added in that update, remains a mystery. Once you build the Springfield Knowledgum, it’s up to Lisa and Skinner to fix the science curriculum. Hopefully the strategy of trying to make science fun will help to increase the aggregate test scores. By the end of this section of the quest line you will find out whether this experiment worked, and if Lisa helped to save Skinner from the wrath of Superintendent Chalmers. The conclusion of this quest line takes place at the Springfield High School with an eleven part quest line titled “High School Low”. To the best of my knowledge, this version of Other Springfield has not changed. It’s a pretty basic town with a few houses, some fast-food restaurants, a school, and a power plant. Prior to the introduction of the Springfield Squidport, the next evolution of Other Springfield looked quite similar to this. 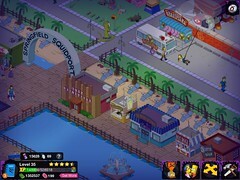 However all versions of Other Springfield have been tweaked to accommodate the new features of the game. The first appearance of the Springfield Squidport appears in the Lv. 16 version of Other Springfield.